When organisations require maximum intrusion resistance and flexibility in a masterkey system, they choose the EVVA 3KSplus. 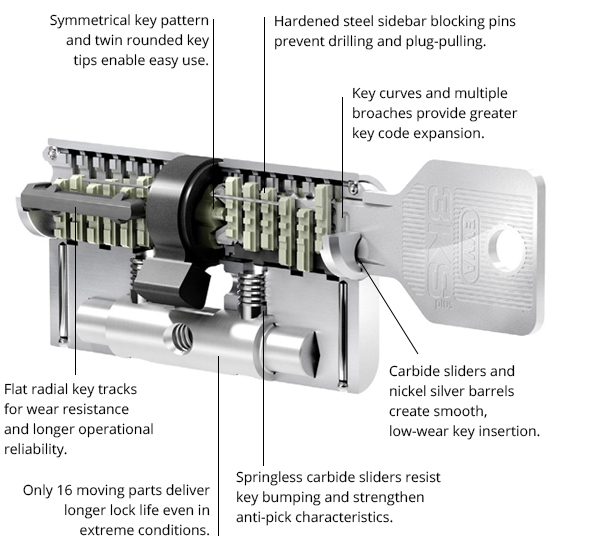 3KSplus provides up to 133 billion possible lock opening combinations is one of the most secure Master Key systems available in Australia. 3KSplus uses a unique pinning system of spring-less carbide sliders that activate two sidebars. The system therefore eliminates key bumping and makes picking and scanning attacks difficult and time-consuming. Meaning, you can use the 3KSplus to install complex locking systems with overlapping hierarchies, with the ability to individualise key profiles. It is perfectly suited to certain industries and organisations that require a locking system suited to having a large number of different users. Organisations include; shopping cetres; retails outlets; universities and colleges; sporting and leisurely centres.